The Sphere Table Lamp is a beautiful modern light fixture designed by Italian designer Marco Agnoli. This must be one of the most beautiful table lamps we have ever seen. 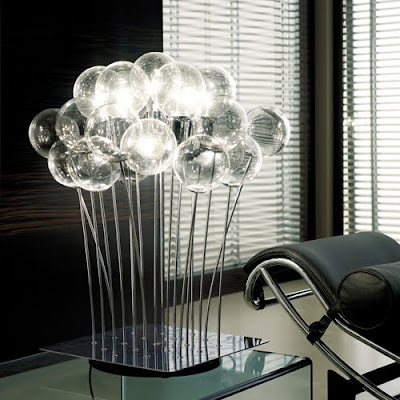 This beautiful light fixture features a distinct glass sphere influenced by the design of the Dandelion flower. Its design also reminds us of the shape of Harry Bertoia's Sounding Sculptures. A beautiful modernist table lamp with an attractive design. This beautiful modern table lamp was featured at the Euroluce Italian modern lighting fair in Milan Italy. Sphere is one of the most attractive modern table lamps ever made. This distinctively modern glass table lamp is the centerpiece of any room. 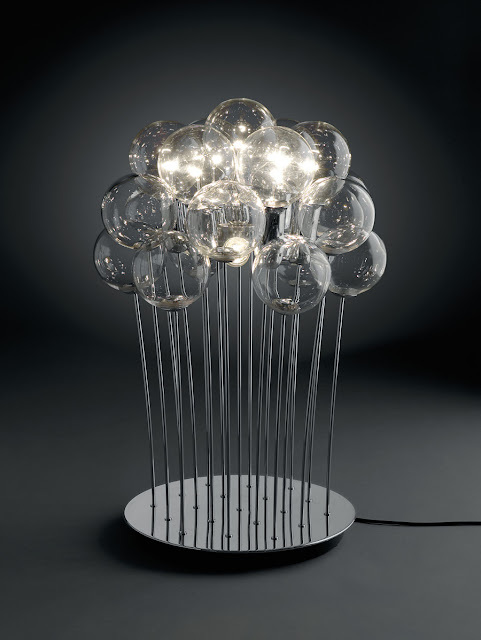 Twelve handblown Italian glass spheres surround an additional seven clear light bulbs in the center. The glass spheres create an attractive lightness to the design. The Sphere table lamp is an extremely elegant and sculptural lamp in both on or off position. Sphere is available with either a round or square chrome plated base. Light bulbs are included. This lamp comes with dimmer switch.